Luxury fully furnished non smoking one bedroom and den suite. The LORD STANLEY is ideally located at the doorstep of world famous Stanley Park which gives you a panoramic harbour, park and mountain view. Enjoy leisure activities on the seawall of Stanley Park. Steps away from COAL HARBOUR MARINA where you can watch the boats sail away and water planes land. Lord Stanley is situated just a few blocks from Vancouver's downtown business district, the Vancouver Convention and Exhibition Centre and Library Square. Easy access to the Lions Gate Bridge takes you to the North Shore Mountains, Horseshoe Bay ferry terminal and world famous Olympic 2010 WHISTLER MOUNTAIN RESORT. Trendy Robson street is only a block from Lord Stanleys front door. Visit Historic Gastown with its cobblestone streets. The finest in live theatre, ballet, opera, concerts, art galleries all within walking distance. Vancouver's culinary delights await you at neighborhood restaurants. Staying at the LORD STANLEY the city of VANOUVER is truly all around you. 24 hour Concierge Service, Secured underground parking, Direct dial phone, Boardroom and lounge, exercise room and sauna. Stefano and Joy have been wonderful hosts. They respond quickly, and really work to accomodate your needs. The suite is small, but it had everything we needed. The in-suite washer-dryer was so handy, the kitchen was well equipped. Also, the supermarket was only 5 mins away that we cooked our meals almost every night. And on the nights we didn't want to cook, we were steps away from so many restaurants, it was hard to choose from! The suite faces north east, with Stanley Park, the marina and the mountains as the view. The suite faces a major road Georgia St, but it was winter time, and we never had to open the windows, so we didn't notice the traffic noise much. We loved our stay so much, we're sad to bid farewell to this cute little suite. Perfect Location, Friendly Front Desk, Great for Cycling! At the entrance to Stanley Park, Perfect location for cycling and walking. 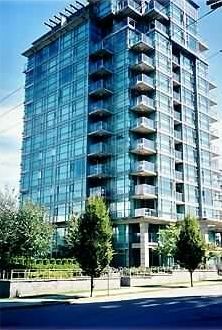 Close to restaurants, supermarkets, and an easy walk to downtown Vancouver. David and his crew at the front desk were friendly, happy, and very helpful. The bike cage was safe, and our bike rides around Stanley Park, to the Aquatic centre, and further afield were enjoyable because our route was often via Stanley Park and along English Bay - such beauty! While it was often raining, it was also cherry blossom season, and we saw Spring arrive. With guest parking, it was easy to receive friends. We loved coming 'home' every evening. Thank you! We arrived here from a luxury rental condo of Vancouver Island. So the unit was felt very small at the beginning. But if you compare a downtown hotel room, price range, location, it is lot better. To get a decent place in heart of Vancouver, with secured parking within this budget is almost impossible. So we are very happy about our stay. The unit is 5~10 min walking distance from Stanley park, English Bay beach, Coal Harbour, grocerry (Safeway), so many different ethnic restaurants. Finding the unit and entering the unit was smooth. Kitchen is small but was enough to cook our full meal. It has dishwasher, laundry, dryer in room. There is bike rental shop very nearby and you can bike to stanley park, coal harbour. The fall color right beside the building was amazing. We just returned from staying at this condo for one week. We were travelling as a family of 3. This condo turned out to be a perfect fit for all of our vacationing needs. We were literally steps from almost everywhere we wanted to be and in a great neighbourhood. The condo was clean and had everything we needed. The front desk staff are excellent! We would stay here again if we ever find ourselves in Vancouver again! My Wife and I went to visit our Son and this Condo was an absolutely amazing location for us. We spent 10 days and the Condo was everything the owner said it was. Convenient with in room laundry and no surprise check in made it start perfectly and the stay ended perfectly as well. We are so glad that your stay was Perfect! Our goal is for all our guests to be comfortable in our condo and enjoy their vacation in our beautiful city. Thank you, Joy. My wife and I rented this neat condo for a week while we visited friends and took in the sights. What a jewel! We found the unit to be exactly as described, no more, no less. The photos were accurate and the unit clean and well maintained. Joy was a pleasure to work with. There are restaurants and a market within easy walking distance. Public transit is close by and will take you pretty much wherever you want to go! Make sure you go to Stanley Park and the Granville Public Market. We had our car so the secure parking was much appreciated. We will surely be back again! BIKE RIDE OR JOG THE SEAWALL AT STANLEY PARK and enjoy the beauty Vancouver has to offer. Please ask for our "lower" than posted rate.